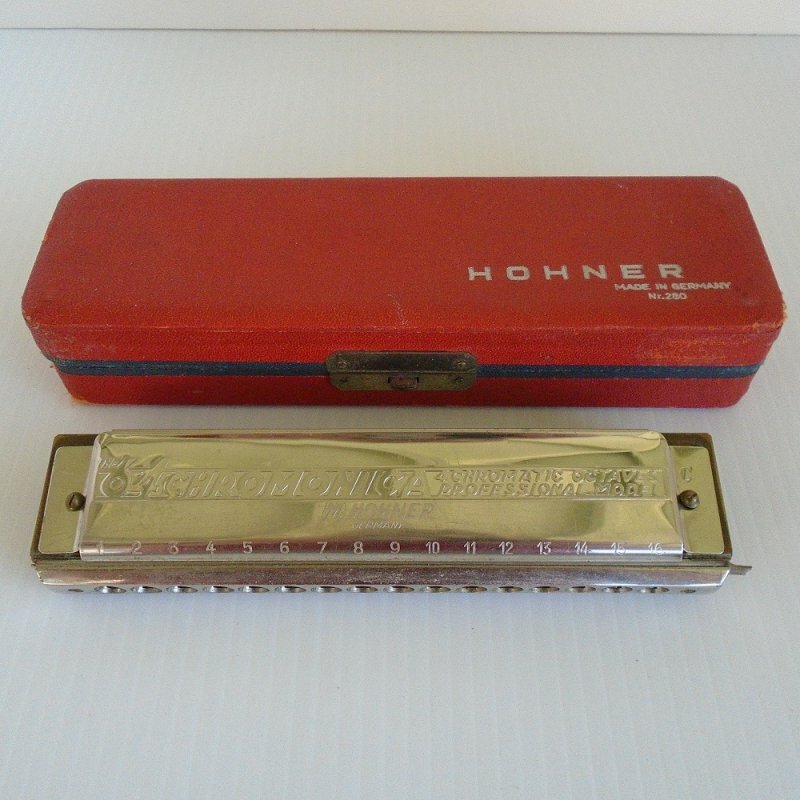 Hohner 280 64 Chromonica Pro Harmonica. Labled 'The64'. Needs a little appearance TLC but still very playable. Estimated 1950s or before. When I purchased this harmonica at a sale recently, I was told by the seller that it was her dad's and that she could remember listening to him play it when she was a little girl in the 1950s. She said it's been packed away for about 12 to 15 years. I tested it and it played just fine (of course, I've never played a harmonica before, but it did make nice music). It needs a bit of TLC. There are a couple of issues with it but if you repair musical instruments, or have another harmonica that died, you can merge the two into one great fun making unit. -On the bottom (the side opposite the side you blow in to), there is a strip of lacquered wood. About half that strip is gone. -There is a slide button, but the 'button" portion is missing and all that remains is the metal piece that a button would attach to. -The original Hohner box is here. The clasp holds it shut, but the back is cracking. 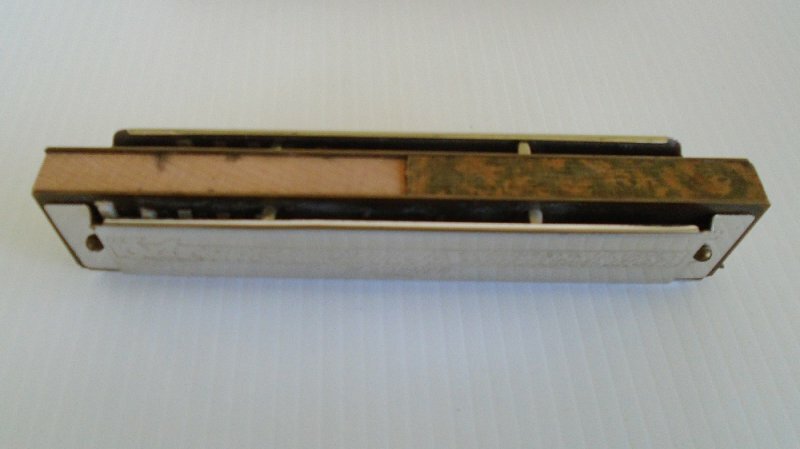 This professional chromatic harmonica was designed to play the "C" scale; each single hole contains 4 reeds (2 chromatic notes and 2 natural notes) by pushing the slide button on the side of the harmonica. 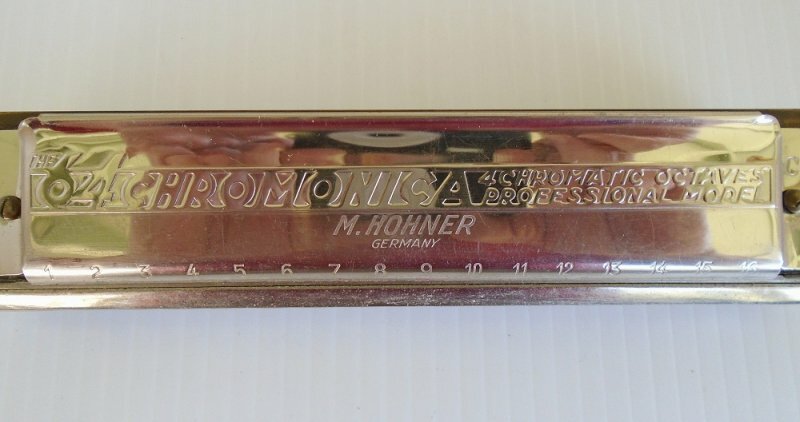 The harmonica is marked "The 64 Chromonica", "4 Chromatic Octaves", "Professional Model", "M. Hohner, "Germany" and "C". It measures approximately 7 5/8" long (push slide button) x 1 5/8" wide (not counting the slide button). Delivery will be via USPS Flat Rate packaging. Buyer to pay $7.95 delivery charges. Shipping is from Arizona. I do combine shipping on multiple items purchased as long as all items can safely fit into a single box. However, my web host is not set up to calculate multiple item shipping costs. At checkout, you will be charged full shipping price on each item purchased and I will refund the appropriate amount of overpayment. If you are uncomfortable with that, you can send me an email with your zip code and stating which items you'll be purchasing and I'll calculate the correct combined shipping charges and send you a custom invoice.